"This is a great way to use leftover ham, chicken, turkey or beef. 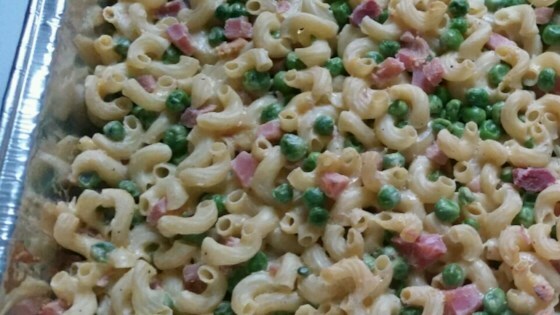 A creamy soup mixture of meat, pasta, cheese and veggies provides a great next day casserole." In a large bowl combine the ham/leftover meat, macaroni, cheese, milk, soup, vegetables, salt and pepper and mix well. Spread mixture into a lightly greased 9x13 inch baking dish. Bake at 350 degrees F (175 degrees C) for 45 minutes, or until hot and bubbly. Good stuff. I halfed the recipe with good results. Next time I might want to put some kind of cracker or bread crumb topping but there will be a next time. Cook the macaroni first also, thanks.